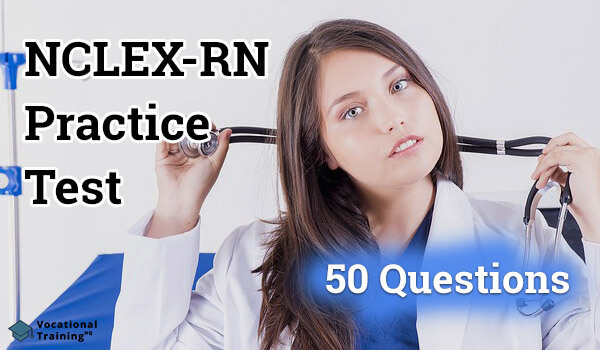 The NCLEX-RN Practice Exam is a nursing examination that ought to be passed before the beginning of the candidate’s practice as an RN. This is a National Council Licensing Examination for Registered Nurses administered by the National Council of State Boards of Nursing (NCSBN). If passed, this examination will validate the candidate’s competence to provide functional nursing care. The exam covers a number of topics in the realm of Medical-Surgical Nursing, as well as medical conditions such as anemia, cancer, tracheostomy as well as cardiovascular diseases among others. Which of the following should be used in order to prevent the development of cerebral edema after craniotomy surgery? Steroids, or glucocorticoids, have anti-inflammatory properties that reduce the development of edema. What should the nurse do if a female patient reports lumbar pain during the administration of blood? Record the patient's vital signs. Notify the blood bank about the patient's condition. Perform further assessment of the patient's pain. Stop the infusion and promote the flow of normal saline. The blood volume of the patient must be maintained and, therefore, the blood must be stopped and the normal saline infused. Positive ELISA and western blood tests. Identified infections associated with HIV. High fever and obvious weight loss. The ELISA, as well as the western blood tests, confirm the presence of HIV antibodies. Cottage cheese contains proteins of high biologic value that are rich in amino acids which are essential for life. An increased level of hematocrit. Flapping hand tremors are a common symptom in the case of uremic syndrome. Which of the following should be a nurse's primary assessment if to a patient with benign prostatic hyperplasia? Bloated lower abdomen would indicate that the bladder is swollen due to the excessive amounts of urine. The nurse should apply warm socks to the scrotum. The nurse should use soft support to elevate the patient's scrotum. The nurse should prepare to perform drainage or incision on the patient. The nurse should assist the patient with a sitz bath. Elevation significantly decreases edema and pain. Myocardial damage is best diagnosed with an assessment of myoglobin. Congestion in the superior vena cava. Congestion in the right atrium. The mitral stenosis causes pulmonary circulation to be under pressure due to the lack of a valve that would prevent backward flow into the pulmonary vein. Patients with hypertension must maintain their condition due to its asymptomatic nature. Nitroglycerin contains vasodilating effects that provoke headaches, lightheadedness, and hypotension. Low levels of LDL cholesterol. High levels of LDL cholesterol. High levels of HDL cholesterol. The high level of LDL cholesterol is a risk factor for the development of PVD and atherosclerosis. Potential alteration in renal perfusion. A potential balance of electrolytes. The potential alteration in renal perfusion may cause artery embolism, aortic cross-clamping or hypotension during surgery. Dairy products are an excellent source of vitamin B12. Which of these physiologic functions would alter in a patient with aplastic anemia? Bleeding and bruising are at high risk in aplastic anemia. The nurse should check the vital signs. The nurse should check the signed consent. The nurse should check the name band. The nurse should check if the patient's bladder is empty. The vital signs are the final check of the elective procedure that must be completed before the patient is removed from the room. What is the peak incidence of Acute Lymphocytic Leukemia (ALL)? 60 to 70 years of age. 40 to 50 years of age. 4 to 12 years of age. 30 to 40 years of age. The peak age range of ALL is 4 to 12 years of age. ALL attacks the central nervous system but it does not cause gastric distension. DIC does not respond to Coumadin, an oral anticoagulant. The urine output is the most reliable indicator that the therapy to the client with hypovolemic shock is effective. Hoarseness is one of the most common symptoms of laryngeal cancer. The fact that it stimulates the production of acetylcholine at the neuromuscular junction. The fact that it decreases the production of autoantibodies that attack the acetylcholine receptors. The fact that it hinders the breakdown of acetylcholine at the neuromuscular junction. The fact that it promotes the removal of antibodies that obstruct impulse transmission. This is a steroid therapy that decreases the body's immune response. This drug is a diuretic that can cause contraindications if there is an inadequate renal function or heart failure. What are the possible advantages of using pen-like-insulin delivery devices over syringes for patients with diabetes mellitus? Use of a gauge needle of smaller size. Lower cost of reusable insulin. These devices provide a discrete dispense of insulin and have improved diligence to insulin therapies by young people. What should a nurse do if a patient suffers from fractured tibia due to a car accident and wants to assess any damage to major blood vessels? The nurse should monitor if there is any swelling of the patient's left thigh. The nurse should monitor if there is increased body temperature on the patient's feet. The nurse should monitor if there us any prolonged reperfusion of the toes. The nurse should monitor if the blood pressure is increased. Damaged blood vessels may decrease circulatory perfusion and prevent blood supply. What should a patient do after his leg cast has been removed? Make breaks between long intervals of sitting and elevate the leg. Inform the physician about any discomfort. Provide hygiene by scrubbing the leg. Practice daily activities that would put the leg into motion. Elevation prevents the edema that would occur in most cases of this type. The ears are a cartilaginous tissue which is likely to result with deposits of uric acid due to the low blood flow. On the palms of their hands. On the palms of their hands and their axillary regions. In order to protect the nerves in the axilla, the patient's weight should be born by the palms of their hands. The nurse should encourage the patient to exercise twice a day. The nurse should encourage the patient to do exercises that support flexion, twice a day. The nurse should encourage the patient to lie still until he the pain vanishes. The nurse should initiate active flexion and extension of the patient's joints. Pain and stiffness in joints would be subsided only through active flexion, extension, and similar exercises. Keep a record of the patient's voiding and bowel movement. Put the patient to a prone position. Perform a check-up of the patient's feet for circulation and sensory reflections. Encourage the patient to increase their fluid intake. If the sensation and circulation are not regular, this may indicate damage to the spinal cord. Hypovolemia is possible to occur during the diuretic phase in which fluid excretion takes place and reaches up to 5 l. per day. A glucose test will determine if the body fluid is a CSF, depending on the present glucose content. Trauma is one of the most common causes of seizure activity in adults of this age. A patient with thrombotic CVA is admitted. What should be a nurse's primary assessment in the first 24 hours? The nurse should check the patient's cholesterol level. The nurse should check the patient's echocardiogram. The nurse should check the patient's bowel sounds. The nurse should check the patient's pupil size and pupillary response. The nurse must assess the patient's pupil size and pupillary response to notice any alterations in the cranial nerves area. "It is necessary to accept a passive and quiet lifestyle". "You might alter your health condition by practicing new, health routines". "Maintain an active routine and stress-relieving activities that would subside fatigue". "Be prepared to use mechanical aids when disabilities progress". The multiple sclerosis patients require positive reinforcement regarding their lifestyle, habits and daily routines. It is important to encourage them to stay active, reduce stress and thus, improve their immune system. Sudden unease and restless behavior is an early sign of hypoxia. In this case, the bladder turns atonic and this requires catheterization of the patient. The irreversible stage is the progression stage that indicates a fast-growing, irreversible tumor. Intensity is as the major indicator that would significantly assess the treatment. Practicing baths with fragrant cosmetics. Sleeping in humified, cold rooms. Pruritus may be boosted by the use of fragranced cosmetics as they dry the skin. Atropine sulfate increases intraocular pressure and therefore is not indicated to glaucoma. Which of the following patients might experience potential side effects from surgical experience? A 67-year-old-patient is an elderly patient whose immune system is likely to be more limited. The nurse should check the perineal area and monitor if the patient shows any signs of having a distended bladder. Glucocorticoids are not used in the treatment of this disease. A syndrome of acute respiratory distress. Laryngeal nerve damage is one of the most frequent complications that occur due to a tracheostomy tube. What could cause a fluid shift in a patient who suffers from a burn injury? An increase in the total volume of blood circulation. An increase in the total volume of intravascular plasma. An increase in the permeability of capillary walls. An increase in the permeability of kidney tubules. An increase in the permeability of capillary walls occurs due to burn which causes a release of a histamine-like substance that provokes a loss of major quantities of fluids. Increased fragility and permeability of the capillaries. Increased fragility and permeability of the capillaries is very common in elderly patients who have an increased quantity of extravascular blood in their dermis. Intermittent hematuria and pain is the most common sign of this type of carcinoma. Which of the following is the most appropriate answer that ought to be given if a patient with tuberculosis asks for the continuity of their chemotherapy? 6 to 12 months is the most optimal period for a tuberculosis treatment that takes a longer period of time to eradicate the Tubercle bacillus. The nurse should provide emotional support. The nurse should check if any infections have taken place. The nurse should promote aids for communication. The nurse should prevent secretions flow into the trachea. Removal of secretions is a top priority in order to provide safe and free breathing for the patient.